Growing up in Soviet Russia during the food shortages of the nineties I am no stranger to people lining up for food. At the height of the crisis each Russian family was rationed only a limited amount of basic commodities that they were allowed to purchase if they first stood in line for them. This led to all sorts of hilarious barters among private citizens–a bottle of vodka for two bars of soap, anyone? Witnessing and at times participating in long food lines in the first world is hilarious for me for that reason. 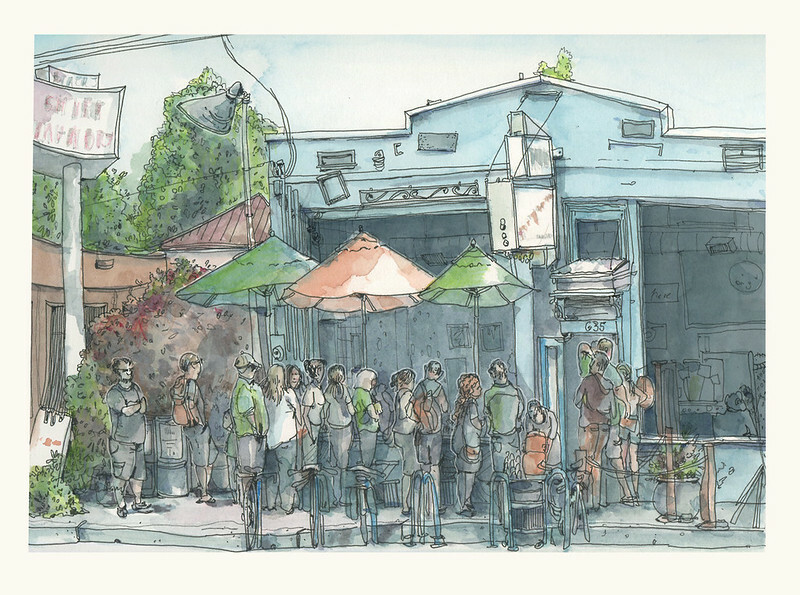 Here is a line of discerning foodies in front of the Porque No Taqueria I sketched last Saturday. They are literally dozens of good restaurants within one mile of us. Rita, I've had such a good time looking at your sketches and reading about the interesting characters and places you've drawn. You are a great storyteller! I'm looking forward to your posts from Singapore.